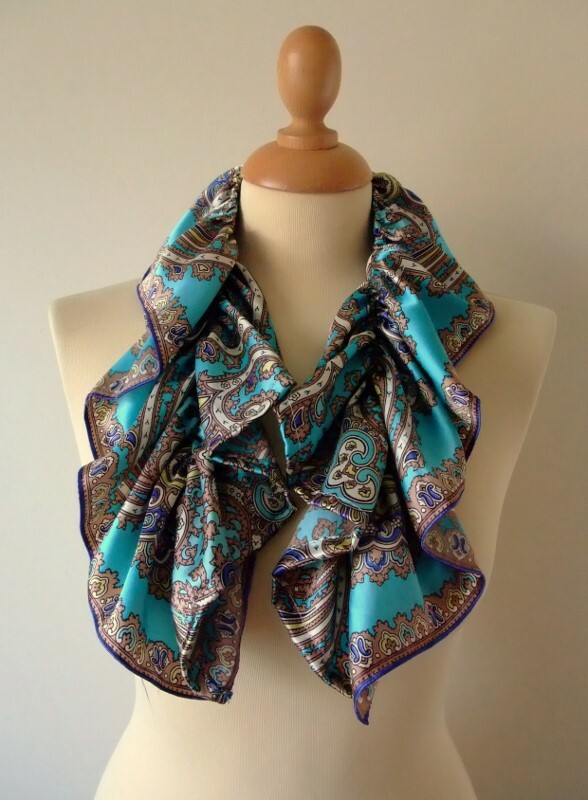 What to do with a vintage St Michael satin foulard in a divine paisley in rich tones of turquoise, taupe and lapis which sadly has several areas of perfume staining to the centre? 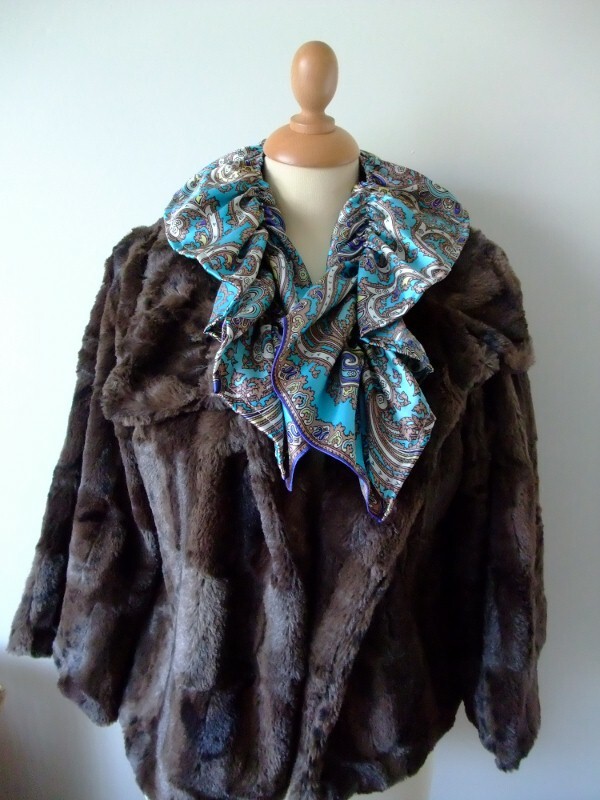 Plus, could I turn it into a longer style scarf as I must admit I don't tend to wear square scarves these days? 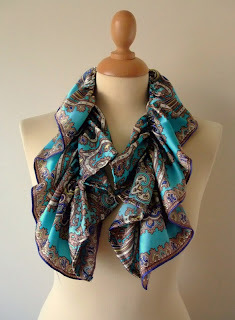 I loved the colours and textile of this scarf, and fancied trying to make a ruffled scarf, so yesterday evening out came the scissors, the rule and some narrow elastic. I wanted to make a 40s inspired ruffled scarf (a bit in the manner of the ruffled dickies of the time) to wear with my latest purchase of a fab vintage style faux fur jacket. I cut two strips off two sides of the scarf, each along the hem and each 23cm wide. I then joined them in the middle. Next I hemmed the long cut side of my scarf (now approx. 134cm long). Back in the 70s, I made many a ruched bodice sundress by hand winding thread elastic onto my sewing machine bobbin. But this time I couldn't find the thread elastic, so I took a narrow elastic, pinned it at the centre of the short edge, set the machine to a zigzag stitch and stitched away as I pulled the elastic out. This was a classic example of my "sew it and see" approach, and I know that at times the central elastic gather is a bit off centre (next time I will mark a straight line down the centre) but it actually turned out OK. Lastly, I stitched the two short straight edges together to join them at each end of the scarf as I thought it looked better rounded off in this way rather than just straight seams. Really pleased with result and will be wearing later today. I am going to make a flower corsage from the remainder so will be posting that soon. as ever a wonderful idea and I love the finished result too! Thank you for your kind wishes and I extend the same to you.I seem to have lost all heart for the world of blog at the moment but I am hoping to be inspired again in the New year...keep an eye out!